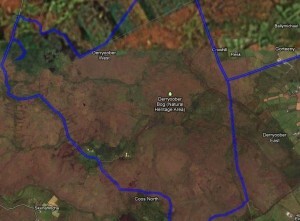 AFTER the pitiable murder of John O’Neill, Richard Burke, Earl of Clanrickard, whose estates in Connaught stretched far and wide, was cast into prison by command of the queen, for it had been determined and resolved by the English that the Irish nobles whom they well knew would be assertors of the Catholic faith should be rooted out completely. The earl’s sons, Ulick and John, provoked by the queen’s injustice, declared war and did not desist from their proceedings until their father was restored to his former liberty. He afterwards dying left them surviving, the one as Earl of Clanrickard and the other as Baron of Leitrim. Of course, Beare doesn’t mention that the sons, Ulick “Sassanach” Burke and John of the Shamrock, also opposed and rebelled against their father and each other, ending with the death of the Baron of Leitrim at the hands of the third Earl of Clanrickard. Something seemingly out of Willy the Shake, don’t you think? The tune was composed by flute and whistle player Patrick “Pakie” Moloney, the uncle of Mike Rafferty (1926-2011),while resting on the Earl’s chair on his way from Derryoober East to Derryoober West, Lough Derg in Co. Galway, which is south of Derrycrag Wood (near Woodford). While names are not all that important, he considered calling the tune “Between Two Derryoobers,” but decided (with advice from some friends) to call it “The Earl’s Chair” instead. While it might have been popular nonetheless, it might not have retained the former name. 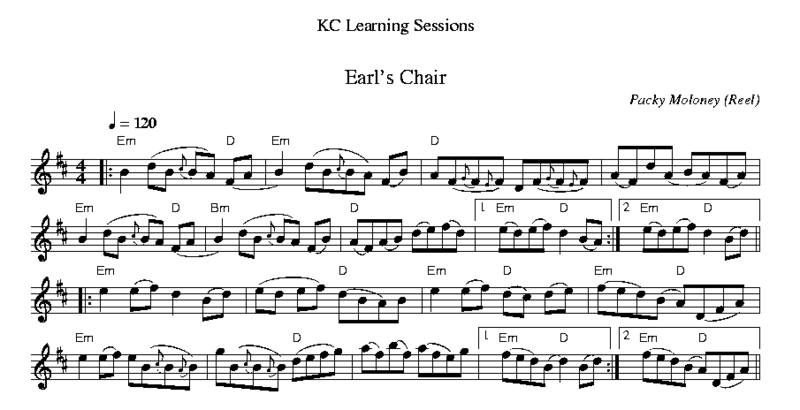 “The Earl’s Chair” has become a very popular session tune. 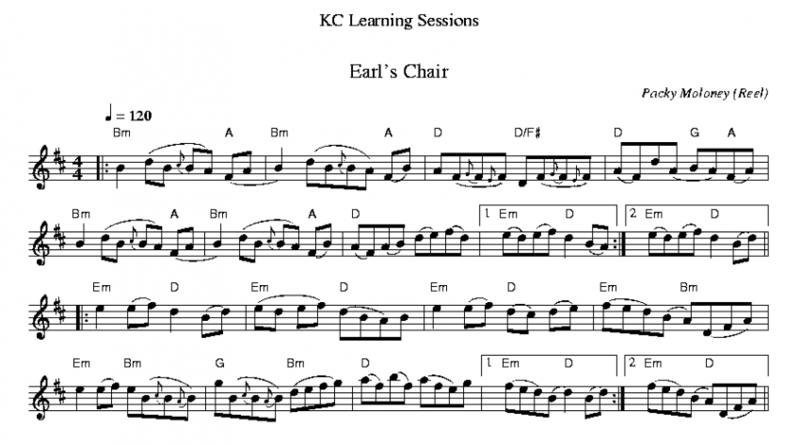 I have the dots twice below, the second one with the usual chords, and the first one with chords I like better. For the ABC click Earl’s Chair1 for the tune with the usual chords, and Earls Chair 2 for the tune with better chords. This article was posted in Reel, Slow Session, Tune, Tune Comment. Bookmark the permalink. Follow comments with the RSS feed for this post.Post a Comment or leave a trackback: Trackback URL.